Daiwa Can (Head office: Chuo-ku, Tokyo. 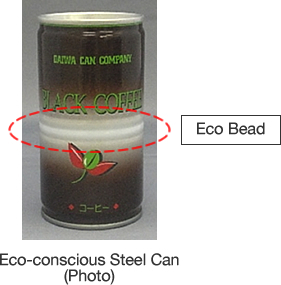 President: Hisakazu Yamaguchi) has newly developed the “Eco-conscious Steel Can (3-piece, 190g)” in consideration for environmental load reduction (see photo below). Note: The 3-piece can is composed of 3 parts: can body, lid, and can end. It is generally used for RTD coffee drinks in Japan. As for weight saving in our cans, we have been implementing that through thinner-walled can body plates. Our efforts almost reached the technological limit theoretically, and the thin-wall venture needed a further engineering development. Daiwa Can thus co-developed with a material supplier a thin-walled processed material, processing technology that renders a thin plate into beverage cans, and eventually the Eco-conscious 3-piece 190g Steel Can. This has enabled us to reduce the material in use by 10 percent in weight (the lightest in Japan according to our measurements) and CO2 emissions by 3 percent (compared with our conventional cans). We made most of our owned can making technologies to come up with the thin plate Eco-conscious 3-piece 190g Steel Can. We also streamlined our can making lines in order to maintain intensity during filling process, and added the Eco Bead (embossed bead) to the middle of the can body. Our can production process carefully considers the environment and uses no water. Furthermore, although usual lightweight can requires fillers to adjust their manufacturing conditions for retort sterilization, our new can allows them almost no alteration of retort conditions in the line. Daiwa Can will begin test production within this year with our customers, and try to go even further with reduction of material use and CO2 emissions. We continue to promote “sustainable development”, starting with the Eco-conscious 3-piece 190g Steel Can, so as to live harmoniously with the global environment.